I was born on 12-07-61 to George and Kathryn Ewertz in Wichita, Kansas. I grew up with 4 brothers and 2 sisters. We grew up on a small farm. Dad mainly grew wheat and raised cattle. I was in charge of milking the cow for milk for our family. My sister attended the chickens. My brother also had a few animals such as pigs and sheep. It was not uncommon for us to have a baby calf or lamb that had gotten too wet and cold in the unforgiving Kansas snow and needed help. We would warm them up by the furnace and rub them down with dry towels. I remember the steam coming off of their coats, as they would dry. Then of course we revived them with a warm bottle of milk. So that started my rehabilitation of animals. I graduated from Andale High School in 1980. Shortly after that I was hired on by the U.S. Postal Service. I have worked there for 20 years now. That is where I met my husband Ken Lockwood. We have been married for 12 years. We soon discovered we both loved the outdoors and wildlife. Together we have volunteered at several organizations and have taken care of lots of different kinds of animals. But the ones that captured our hearts were the magnificent Birds of Prey. We were amazed at their beauty, independence and elusiveness. Their strength and character inspired me. I have such a respect for them not only because of their physical strength but I have seen their courageous and unmatchable will to live. No other animal that I have worked with has shown so much desire to stay alive under such severe injuries, as the Birds of Prey. 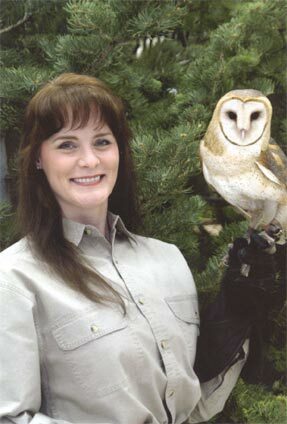 The International Wildlife & Rehabilitation Council (IWRC) certified me in 1998. I also received my permit from Kansas Wildlife & Parks for Rehabilitation that same year. Since then I have cared for hundreds of injured birds. I realize the need for rehabilitators and educators concerning our feathered friends. I, along with my husband Ken, have started a facility called Eagle Valley Raptor Center.